There’s always been more than a little bit of fascination going around when it comes to the Vikings and ancient Europe, and Viking Bingo has arrived to help welcome you into a world of games and bingo cards occupied by big, burly, bearded adventurers. GET UP TO 500 FREE SPINSNew Customer Offer. T&Cs Apply. 18+. Please Gamble Responsibly. Viking Bingo is dedicated to providing gamers with the best bingo and instant win games like roulette, slots, scratchcards, video bingo, 75 ball and 90 ball bingo, on the internet. Whether or not the Vikings actually had time to play bingo is a completely different matter, but what remains here is that the main Viking Bingo promo code will give you a stack of spins to play with if you’re just getting started, that’s more value for money and an increased playtime for you, not bad at all! The site is amongst the Jumpman Gaming stable of platforms which also includes the Lucky Cow Bingo site, meaning that for some gamers who have played elsewhere online, the layout, promotions and overall feel of the site may seem a little familiar – not that this necessarily a bad thing! We will look into a number of factors in this review which will hopefully help you to make up your mind as to whether or not you’d like to sign up and get started – with bingo and slots available, and with a look which will likely appeal to those looking for fun first and foremost, this is a site which does well to appeal to the majority crowd. Though we will need to discuss certain factors, such as whether the bonus codes on offer at the start of registration are worth your time, and whether or not the mobile site is worth checking out. This relatively new platform is one of the more pleasing-looking Jumpman Gaming entries, though we will need to dig a little deeper into our Viking Bingo review to find out just how worthwhile everything seems below the surface. 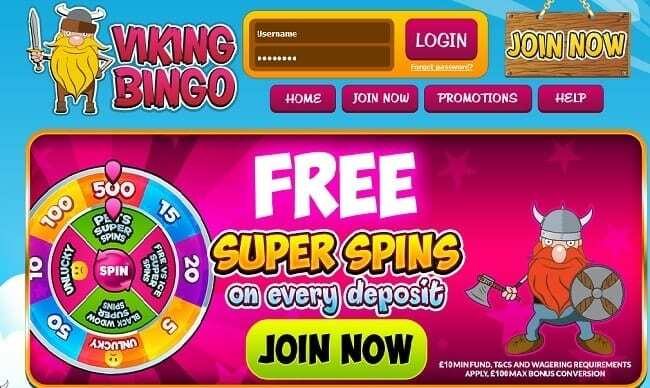 The Viking Bingo promo code offers for April 2019 aren’t for basic bonuses or bingo tickets, instead, the site leads with the old Jumpman staple, the prize wheel. Even before you register, you’ll be able to see this feature front and centre stage, offering the chance for you to win super spins on top games and the chance to come back and win freebies again and again. The main site states that their welcome bonus will give you the opportunity to win at least 50 free spins to play on Fluffy Favourites, a well-known standard that many seasoned gamers are going to recognize immediately. There isn’t much mention of the 500 spins bonus guarantee anywhere but on the main page, however, so we would advise you to keep checking those terms as well as your gaming balance as you go along. The Viking welcome offer comes with certain terms attached, as does the prize wheel in general, which can pop up again from time to time providing you stay loyal to the site and pay and play regularly. To start, you will need to deposit at least £10, this isn’t too big an ask as things go, as there are plenty of deals out there which ask this of their players depositing for the first time, but it’s how your winnings from the wheel spin bonuses are used that counts. There’s a 40x wagering requirement on all bonus funds received from free spins and deals – and you can only start wagering this once your real funds have been spent. In addition to this, once you’ve met wagering requirements, you will only be able to transfer £100 of your bonus winnings into real cash. What is also rather concerning is that a clause on the welcome offer states that the super wheel is a game of chance – and, as the website states, ‘winning a prize is NOT guaranteed’. These terms are, for our money, rather conflicting and somewhat restrictive compared to other sites. A little more detail or clarity would be very much welcome. The site does at least run regular jackpot opportunities and deals which pop up on a regular basis, meaning that you’ll be spoilt for choice if you choose to stick around and play regularly. Do bear in mind, however, that certain bonus rules will apply, once again, meaning it’s going to be entirely up to you as to what you’d like to get involved with. You shouldn’t ever base your feelings on a site based on its deals alone, however, so it’s important for us to take a closer look at what else is on offer. Bingo, of course, is front and centre here, with a choice of 75 or 90 ball action for you to choose from – there is a little more variety elsewhere, but the rooms and games here are at least presented in a pleasing fashion, to the extent that they load quickly and look great, too. There’s a variety of different slot games on offer from some recognisable developer brands, meaning that you can leap into classic games such as Fluffy Favourites with free bonus cash from Viking Bingo promo codes to your heart’s delight. There doesn’t appear to be the focus on casino emulation here that you might find elsewhere – but with bingo being pushed forward as the main feature and draw for players, that isn’t really much of a surprise. What is disappointing is the fact that much of the site’s content only becomes available to you once you sign up. This is an issue that has befallen Jumpman Gaming bingo sites in the past, we do appreciate window shopping so that we can take a closer look at the games and titles lining up for us – especially with so many developers involved, but you won’t get a chance to see exactly what this site has to offer until you commit to registering. That’s an extra couple of points knocked off for us. This means that the games catalogue is very pleasing indeed, even if there’s very little in the way of casino standards to pick from. Some of the Viking Bingo sister sites are Rocket Bingo online and Charming Bingo, both of which we have reviewed here. Providing you have a UK card to hand, you’ll be fine to deposit and withdraw here. A lack of e-wallet support isn’t particularly welcoming, and – we’re sorry to say – neither is the prospect of only being able to withdraw once you have £30 of real cash in your wallet to walk away with. Visa, MasterCard and Maestro are all covered here, but we feel that there could be much more scope covered if the site introduced acceptance of services such as PayPal, Neteller bingo deposit or Skrill. This is one downside from our Viking Bingo review. You may need to wait up to 12 working days to receive your cash request, a little longer than most sites request, though this will largely be thanks to the platform’s dependence upon card payments and withdrawals. Deposit with £5 on your first payment in, but do be aware that you’ll need to double this up to £10 on future payments. What Jumpman does get right is the mobile focus. All the games here are already pretty well optimised for gaming on the go, and to that end, we don’t think you’ll have much of a problem logging in and enjoying the titles and bingo rooms on your phone or tablet. There’s no official app at this time, but the Viking Bingo mobile site does at least offer you all of your login options and banking standards on a nice, solid, easy to navigate plate. View our Barbados Bingo review to see another brand with good mobile compatibility. Viking Bingo promo codes may have a tantalizing deal lined up, but there are a number of terms and conditions, in terms of bonuses, withdrawals and more, which are far too restrictive in comparison with the gaming world at large. Keep a close eye on terms should you wish to sign up here. We would recommend giving it a try though if you enjoyed our Viking Bingo review and found it helpful.